How confident are you in your ability to create compelling holiday images? Did you know that posts with images produce 650 percent higher engagement than regular text posts? As a webinar designer and presenter for Constant Contact, one of the most frequently asked questions I hear is how to create images fast. The good news is you don’t need to be a graphic designer to create festive holiday images. There are plenty of easy-to-use tools to help you create quality images quickly and affordably. So grab a pen and paper or bookmark this post — you’re going to need it this holiday season. See these tools in action! Join me on November 17th for a free holiday webinar: Last-Minute Holiday Email Marketing Ideas. The canvas has a grid to help you center your design. Artworktool allows you to add and manipulate text over images, add shapes, and layer additional images such as your logo onto your piece. When you’re finished, simply save it to your Library and it’s ready to be inserted into your Constant Contact email. Give it a try next time you’re creating an email to send to your subscribers. 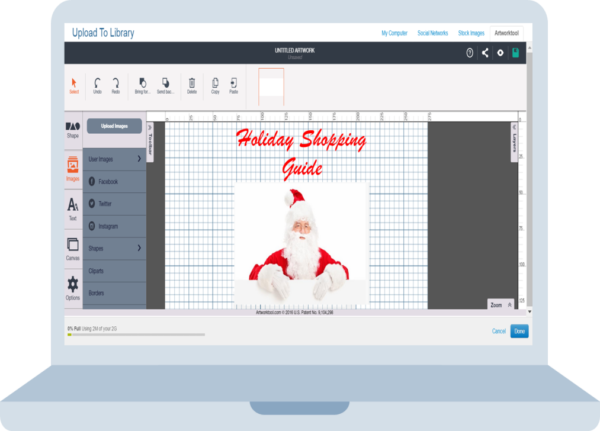 Suggestion: Use Artworktool to create a holiday banner image with your logo to make your marketing message more festive for the season without deviating too far from your brand. Perhaps you’re familiar with Microsoft PowerPoint from presentations you gave to your boss or employees. Regardless of how you encountered PowerPoint, the best part about it is that most offices will already have this installed on the computer you use. It will save your design as an image to your computer and you can then use it in your next social media post or Constant Contact email. Suggestion: Use PowerPoint to create a shopping guide or poster detailing holiday sale items. Include clear images and descriptions of the offer or prices. Group all the images on the slide together and right-click to select ‘Save as Picture’. 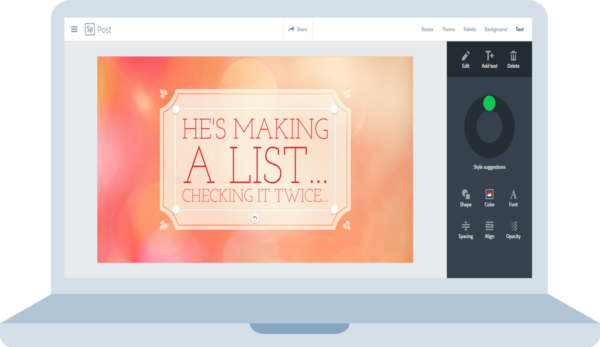 Canva is a team favorite when it comes to free image-editing tools. It’s really easy to use and has tons of free options. They also have a paid version called Canva For Work, which starts at $12.95/month if you plan to be making images regularly and on a tight schedule. 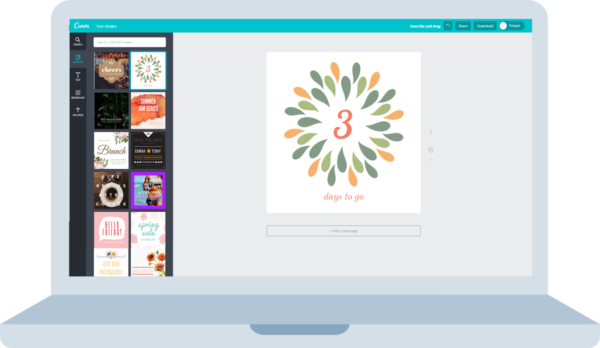 Canva has ready-made backgrounds and stock images that you can use to spruce up any offer or announcement image. You don’t have to pay for a stock gallery or spend hours perusing free public images galleries. Suggestion: Use Canva to design images to promote your holiday event. Choose from their selection of background images and fonts to create a professional looking image, which can link to your event registration page. A beautifully-designed image will invite more people to register. Another team favorite is PicMonkey. 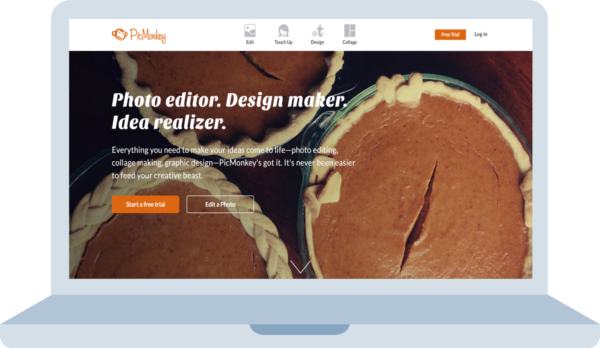 Starting at $3.99 annually and $5.99 monthly, PicMonkey is another very affordable option. I love using this tool for image touch-ups, airbrushing (for those less-than-perfect selfies,) or for creating a collage to show off highlights of an event. Give it a try when you want to say a lot of things in one image or if you want to erase a few wrinkles before you create a poster. Suggestion: Use PicMonkey to create a Facebook Cover Photo detailing your holiday offer, hours, and information. Use it to enhance individual images before creating your Facebook Cover Photo. Then, post to your Facebook Business Page! 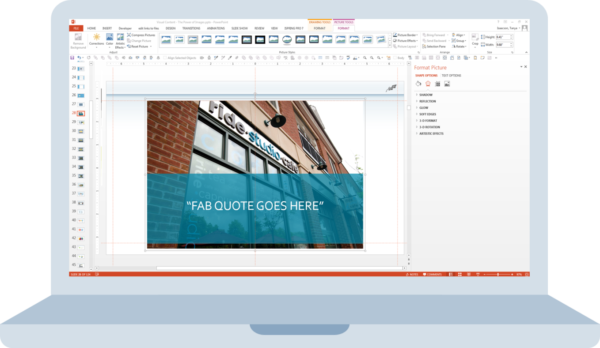 Pablo is a free tool, designed specifically to whip up a quote image with text overlay. Think: quote images, memes, or image-based announcements for social media. 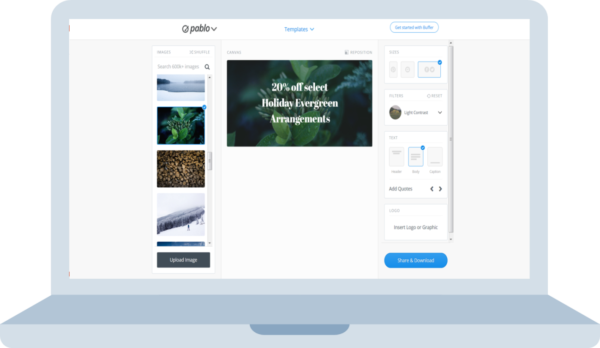 This tool is put out by Buffer and offers image templates sized specifically for Twitter, Facebook, and Pinterest posts. It is limited in scope, but for quick social media posts, it’s the fastest you’ll find. Give it a try when you want to create an inspiring quote-image or count down the days left until Christmas. Suggestion: Use Pablo to quickly create images with text overlays that you can use as social media posts throughout the season. Detail your holiday offers in these images and select the size appropriate for Pinterest, Facebook, or Twitter. Schedule these posts before the busy season starts and you’ll have engaging holiday images detailing your offers throughout the season. I personally adore Pixlr. It functions a lot like Photoshop but watered down so as not to overwhelm you with too many options. Starting at $1.99 per month or $14.99 per year the desktop version is in many a small business budget. That said though, if you have the time and eye to create a truly original piece of work mostly from scratch and you don’t want to pay for an Adobe product, this is the way to go. 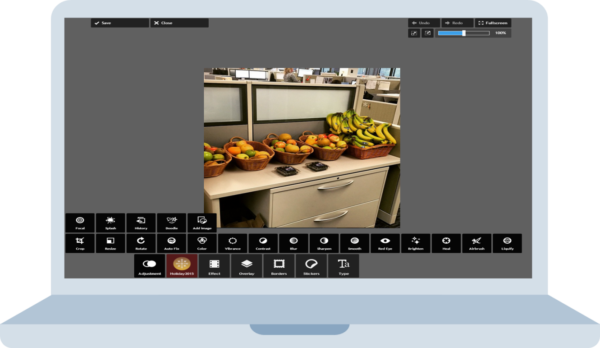 With advance photo touchup and airbrushing, you can use it on a mobile device or desktop. Suggestion: Selling a unique item? Use a collage to show how it can be used and enjoyed. Use Pixlr for quick photo touchups and filters. Choose from photos you’ve taken on your smartphone then quickly edit and arrange them into a captivating holiday collage. Adobe Spark is an awesome new photo-editing tool from Adobe, designed to be more approachable and easier-to-use — while still maintaining some of the robust features you’ll find in other Adobe products. Spark is a free tool with some exclusive features available to Creative Cloud members. It has a lot of those great ready-made elements like backgrounds, stock images, and social media size templates, but as an added bonus it’s also a video editor! If you’re looking to go beyond images, but you don’t want to learn another platform, stay with Adobe for your image creation and video editing needs. Suggestion: Use AdobeSpark to create a gorgeous image of your window and store displays, holiday decorations or products to post to Pinterest. Simply select the Pinterest-sized template, create an image and share it to Pinterest with a link back to your product page or website. Stand out this season with festive holiday images. Get a head start with these image tools and you’ll be calm as a cucumber when it’s holiday crunch time. Want to see these tools in action? Join me on November 17, 2016 for our Last-Minute Holiday Email Marketing Ideas webinar. I have the last-minute holiday email marketing ideas that you need to capture those crucial end-of-year sales. Sign up for the free webinar here. We’ll send you a recording of the event even if you can’t attend live. See you there!